I really did have a Ten Year Plan to get elected to the Legislature. First thing was to start a store-front law office in a poorer section of St. Paul. Second thing was to remember not to wear my ambition on my sleeve – just get involved in the community, volunteer for some local Democrats running for office, and see what happens. But first I had to pass the Bar Exam. I found a cheap apartment near University & Dale, started driving a taxi-cab, umpired Rec League softball games to make extra money, and studied for the Bar. Meanwhile I joined the School Board’s Integration Review Committee and started volunteering at the St. Paul Tenants Union, which led to playing softball for the St. Paul Riff Raff (the Tenants Union team) in the Cooperative Commonwealth Co-Rec Softball League. The Bar Exam Results arrived in the mail on a Saturday in October. I generally didn’t eat breakfast and the mail came just before noon. The Landlady heard my excited scream for joy opening the envelope at the mailbox and invited me in for a celebratory beer. After the one beer I tried calling some friends but no one was home. Too excited to eat, I filled my llama’s hoof gourd with a mixture of whatever liquor I had in the cabinet and headed on the city bus to my alma mater’s Homecoming Game to see if I could find some friends there. Hey, Duncan was there! After finishing off the gourd, we went over to the fraternity house and drank some more. Around 5 o’clock I tell Duncan I’m past my limit. He says he knows of a party that starts later, but I can crash at his place by Raymond and the railroad tracks for a couple hours. Not eating anything all day really had my head spinning, so when I couldn’t lie down I decided to go for a walk. I’m just about to stagger across the Railroad Bridge on Raymond when I sense two guys coming up behind me and before I know it they’ve walloped me along side the temple with a baseball bat, fished out my wallet, and heaved me over the embankment, leaving me for dead. When I came to, I first thought I was River-Banking (a favorite pastime in my college days), but then saw the lights of the Amtrak Station in the distance and walked there. The station guy wouldn’t open the door for me (the station isn’t open to the public except the two times a day a passenger train pulls in, one from the East, one from the West). However, he did call the cops for all the hammering at his window I kept up. When I saw what a bloody mess I was at the hospital I understood why he’d been fearful to open the door. 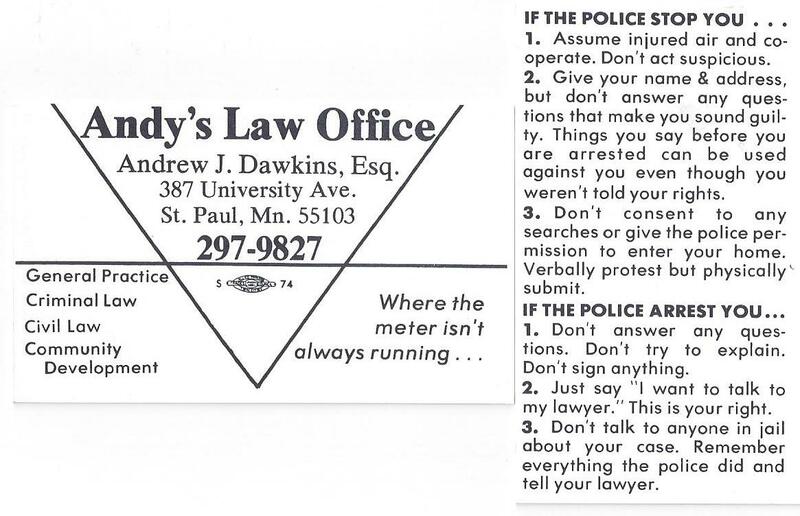 That’s how I spent my first day being a lawyer in Minnesota, getting mugged. Fortunately, better days were soon to come. 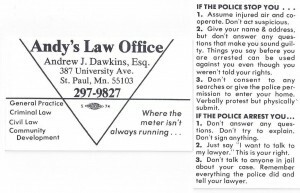 Within weeks of opening “Andy’s Law Office – Where the Meter Isn’t Always Running,” working out of my apartment, I had enough clients (mostly referrals from the Tenants Union) to quit driving a cab. Within months I met another lawyer working out of his home, and together we rented a store-front office on University Avenue, where, when the fall leaves blew, they literally blew right in the door up to my desk, and when the bus hit second gear pulling away from the corner it drowned out any phone conversation I was having. And within a year I was taking on some pretty high profile cases.